In 1994, hip-hop artist Nas released his critically acclaimed album Illmatic, which has become one of the most revered albums in hip-hop history. 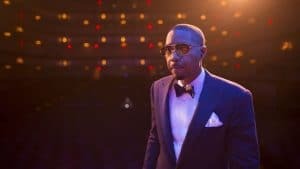 Twenty years later, in 2014, Nas teamed up with the National Symphony Orchestra at the Kennedy Center to stage a symphonic rendition of the album. “Live from the Kennedy Center: Classical Hip-Hop,” the new concert film Great Performances, gives viewers front-row seats to this unique collaborative performance. The film premieres Friday, February 2, 2018 at 10 p.m. on CPTV. The program will be available to stream the following day at pbs.org/gperf and PBS apps. Illmatic is a densely textured, deeply lyrical portrait of life in the largest public housing project in North America: the Queensbridge Houses in New York City. The combination of Nas and the orchestra reinvents the sound of some of his most popular songs, like “N.Y. State of Mind,” “The World Is Yours,” “Memory Lane (Sittin’ in Da Park),” and “It Ain’t Hard to Tell” to create a classical hip-hop journey.